mHealth: new portable medical device aimed at fighting HIV, tuberculosis in the developing world. 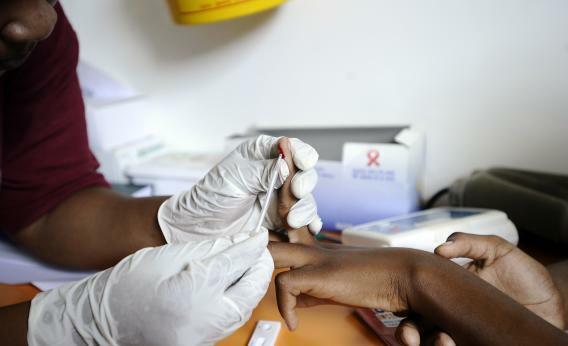 A nurse takes a blood sample in a mobile clinic set up to test students for HIV at a high school in South Africa. In less time than it takes to get a pizza delivered, a new mobile device could diagnose diseases like HIV and tuberculosis. The gadget, highlighted recently by Cornell Chronicle, is part of the broad trend toward mobile technology in the medical field. Luo, a biology and environmental engineering professor, found a way to amplify synthetic DNA, which is designed to lock onto pathogens and form chains. This chain is easier to detect and see than one pathogen molecule or one strand of DNA when under a UV light. Kan, an electrical and computer engineering professor, created a computer chip that identifies the molecules and can measure their mass and other characteristics. The chip uses the same technology as many mobile devices, which would allow for easy integration into existing hardware. Working together, the two components would be able to identify a disease in about a half-hour. This device is not quite a tricorder, a Star Trek technology that diagnoses and monitors patients, and it does not meet all requirements of the earthly version sought out by the XPrize foundation competition. The project did, however, receive grant money from the Bill and Melinda Gates Foundation. The charity, as part of a global health initiative, supports the development of inexpensive point-of-care technology. As the developing world lags behind in medical care, organizations and entrepreneurs take to creating affordable diagnostic and treatment technologies that can help halt the spread of disease in places without robust medical care systems. This new device, though, has yet to be tested in the climates of developing countries. One of the professors’ next steps is to experiment with how the technology works with less-than-ideal factors like dirty water, according to the Cornell Chronicle. This plethora of new mobile medical technologies meets an obstacle: the ability of individuals in developing countries to use advanced devices. Gienna Shaw, an editor at Fierce Mobile Healthcare, points out that in many areas, medical professionals lack resources and are not used to working with medical technology (even as mobile devices are becoming more prominent in developing nations). For mobile medical technology to go from academic setting to transforming health care in the developing world, the devices need to be accompanied with technology awareness and education.